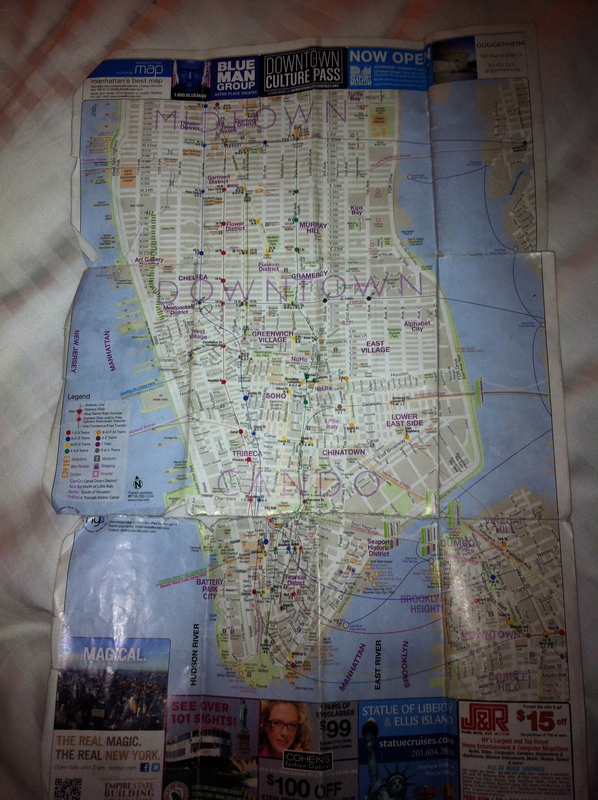 After almost two weeks, I still have the map that gave me grief on my first day in New York City. Suffering with jet lag, this map that made me cry when I first set eyes on it (see Transformation in a day). I can’t go anywhere without this map. I have others but this is the one I refer to all the time. I thought I had lost it one day and panicked. I have others but I want this one. It is about to fall to pieces. I could get another the same. It won’t be this one so I don’t. It is a two sided map. Midtown, Downtown and Financial Districts on one side and Uptown (where Central Park resides) and Harlem on the other side. Three more days is all I will need it for. It is the best and most trustworthy map. I depend on it. It hasn’t failed me so far. I can’t leave without it.